Flash photography is a different world of creativity which requires a new experiment everyday. Adjusting a light, setting up the color temperature and creating the effects for your subject are some of the important aspects of flash photography. Most of the camera comes with a built-in flash unit and even if they don't, you can use the compatible external flash units to meet your needs for the extra light. You can use the built-in flash or the external flash unit if the natural light source (day light) is not working for you or if you do not have any external light source at all (dark situation). When you work everyday with the flash, you might want to do an experiment with the lights in different scenarios. Sometimes you want to use the direct flash to your subject, sometimes you want to use the bouncing flash or even kicker flash to give an extra ordinary effect to the subject. If you are just learning about the flash photography or do not have enough experience in flash photography, you might not get the exact result you want. As you learn more and gain more experience, you feel more comfortable with the settings which brings more confidence to you. If you are interested about the flash photography, you might be looking for some guides or helpful resources on how and where to start from. Don't worry, I have a good news for you. Nikon School has produced a DVD called Nikon School presents A Hands-on Guide to Creative Lighting featuring two prominent photographers, Joe McNally and Bob Krist. The DVD is professionally done and very well designed to give the most out of it to the viewers. Total DVD is two and half hours long. The DVD begins with a detailed overview of basic lighting technique by Bob Krist. He explains everything about the technical aspects of Nikon flashes like CLS, i-TTL, Master flash unit, Remote flash units and working with the group flash units. He also demonstrates the light effect to the portrait photography by actually doing it inside his studio which I found very informative. You will get a chance to learn many things about the lighting by watching that part. Bob then introduces Nikon flash gears SB-600, SB- 800, SB-900, SU-800 as well as other flash kits. In the second part, for about one and half hours, Bob Krist meets with Joe McNally at the ballet dance school in Boston where they shoot with the students and demonstrate how does the flash work in real life situation. Later, they go to few other locations and do the rest of the shootings. Joe McNally does the shooting part and Bob Krist is there assisting him. Bob asks lots of questions to Joe from the viewers perspective which is very helpful to understand the process of working with the flash in various lighting situations. 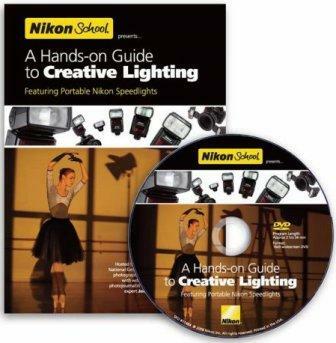 If you watch the DVD and practice as they suggest, you will be mastering Nikon Creative Lighting System very soon. I can't get enough of watching this DVD and learning new tips and tricks every time I watch the DVD.